“When tea is more than a drink and the tea ceremony is understood and practiced to foster harmony in humanity, promote harmony with nature, discipline the mind, quiet the heart, and attain the purity of enlightenment, the art of tea becomes teaism. The term “chadao” has two words, the first being ‘tea’ and the second the Chinese loanword tao/dao/ native suffix -ism (also Japanese: 主義), and could thus be read as ‘teaism’. Another, more literal reading of the word is the ‘way of tea’ (茶 tea and 道 way), comparable with for example 弓道; the way of the bow. 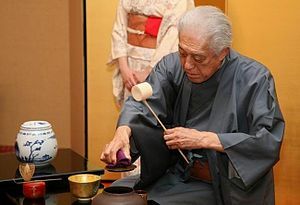 The term can be used to describe tea ceremony as the interests in tea culture and studies and pursued over time with self-cultivation. Teaism is mostly a simplistic mode of aesthetics, but there are subtle insights into ethics, and even metaphysics. Teaism is related to teamind. A sense of focus and concentration while under the influence of great tasting tea. or head to the shop !